Is anyone else in total denial that June is almost over?! Like, what the heck?! Time is just flying by so far this year. I truly felt like February was just a few weeks ago. Whew. One good thing about June ending, though, is that July 4th is next week! Woo hoo. One of my favorite holidays! It epitomizes summer for me. Grilling, burgers, swimming, hot dogs, fireworks, s’mores, family, and BBQs! All good stuff. This year, because the holiday falls on a Wednesday, we’re going to keep things fairly low key and just hang out at home. I’ve got a grilling menu planned, along with some fun dips and snacks, but our tentative plan is to just hang poolside ALL. DAY. LONG. And then take Kieran to see our local fireworks in the evening! He LOVED them last year. Our town also does a parade every year, and he loved that as well, so we may try to make it out for that as well. It’s so much fun watching these classic moments through a child’s eyes. It’s one of the best parts about being a parent, in my opinion. To kick things off, I’m sharing a fun burger recipe with you all today! 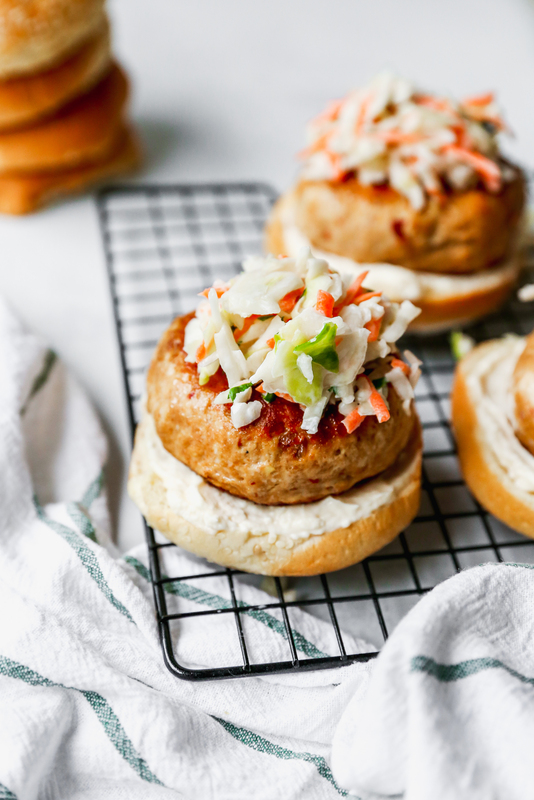 It’s a Korean twist on a chicken burger, mixed with some classic American flavors. And it is damn tasty. I have been making a variation of this burger for years, but this version is probably my new fave. It’s spiced up with Korean chili paste, toasted sesame oil, soy sauce, and tonnnsss of fresh ginger and garlic. So. Much. Flavor. They have so much flavor, in fact, that this is one of the few instances where I don’t think the burger needs cheese. At all. Blasphemous, right?! In all seriousness, though, I am a cheese FREAK, and if I’m telling you this burger is so flavorful and delicious without cheese, you best believe it. 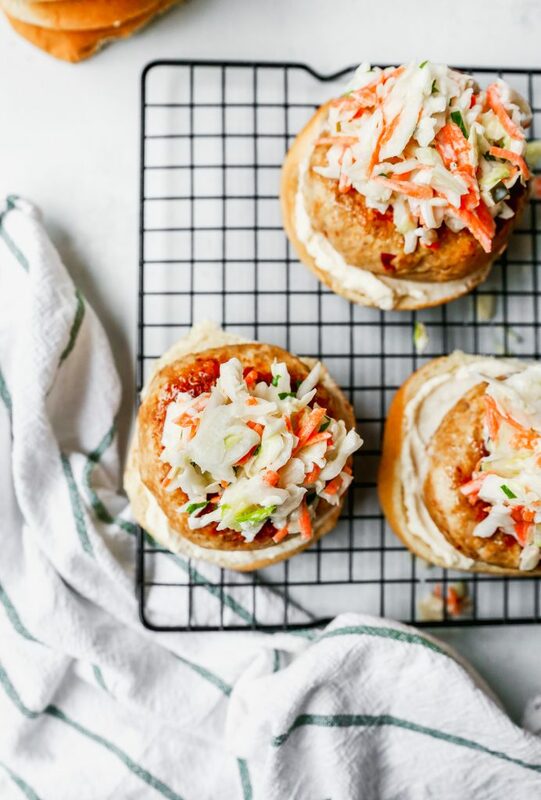 In lieu of cheese, I DO top these with a fun slaw. Turns out, I really like slaw on my burgers. I’ve already done this a few times on Yes to Yolks (see here and here). THIS slaw, though, is totally fun in that it tastes like a dill pickle! Yup! 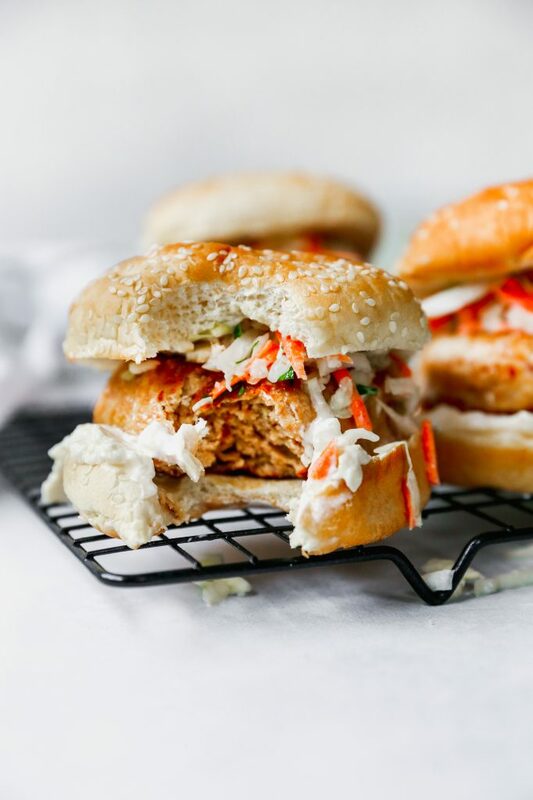 The slaw is crunchy and tangy and wonderful, and loaded with that pickled flavor I adore. I seriously could eat dill pickles all day, every day. I find them incredibly addicting. If you are NOT a dill pickle fan, however, you can simply omit them and the pickle juice that goes into the dressing. 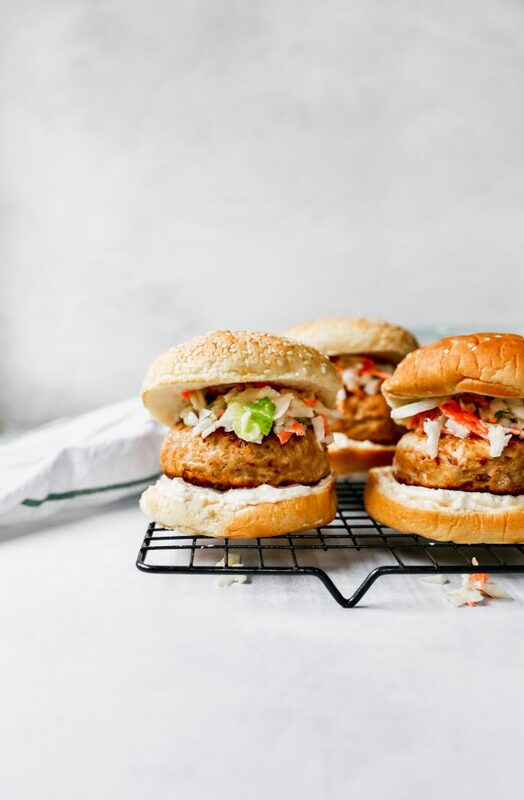 The slaw itself is pretty classic and will taste delicious on top or alongside these burgers. To add a creamy element, I whipped up some garlic mayo, which is soooo simple. While you can totally make your own mayo (something I love doing, actually. It tastes so much better! ), I took the easy route this time and used my favorite store-bought brand and just added in some Dijon mustard for kick and some grated garlic. Again, SO MUCH FLAVOR. The creamy layer really rounds out the burger textures nicely. And I’m alllll about that texture. Yummmm. Just look at that delicious bite! 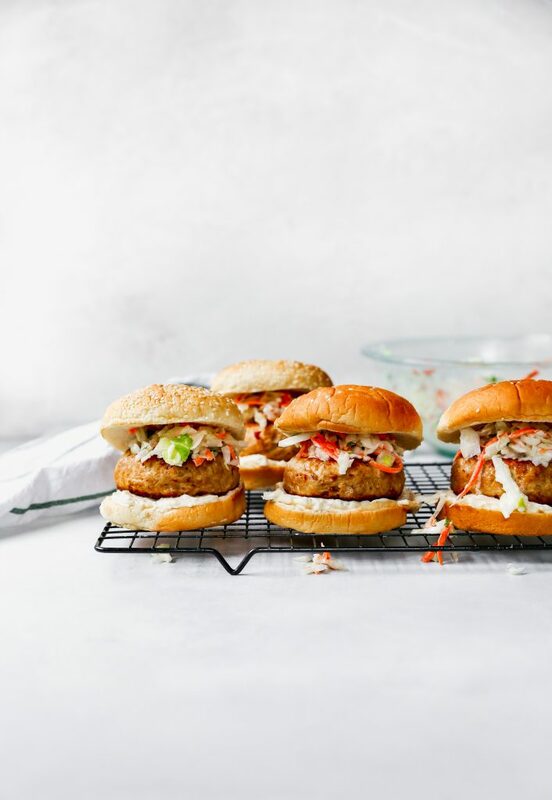 These flavor-packed burgers will be making an appearance again very soon in my kitchen. 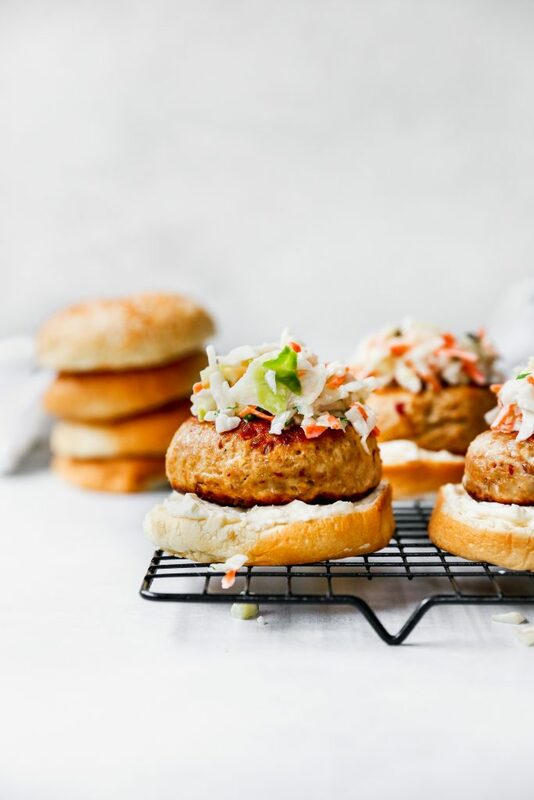 They would be the perfect addition to your July 4th grilling menu! In a large bowl, whisk together the vinegar, honey, pickles, pickle juice, cilantro, yogurt, and mayo. Season, to taste, with salt and pepper. You can also adjust the vinegar/pickle juice/honey quantities to your tastes – coleslaw is one of those things that should be made the way YOU like it. Add in the coleslaw mix and toss until everything is evenly coated and mixed. Cover and refrigerate for about 20-30 minutes. In a large bowl, combine all the ingredients except the chicken. Taste and season as needed with salt and pepper. Add in the chicken and mix to combine. Form the mixture into 4-6 patties and place on a plate. Cover the plate with plastic wrap and set the burgers in the fridge to chill for 10 minutes. In the meantime, preheat your grill or grill pan to medium-high. 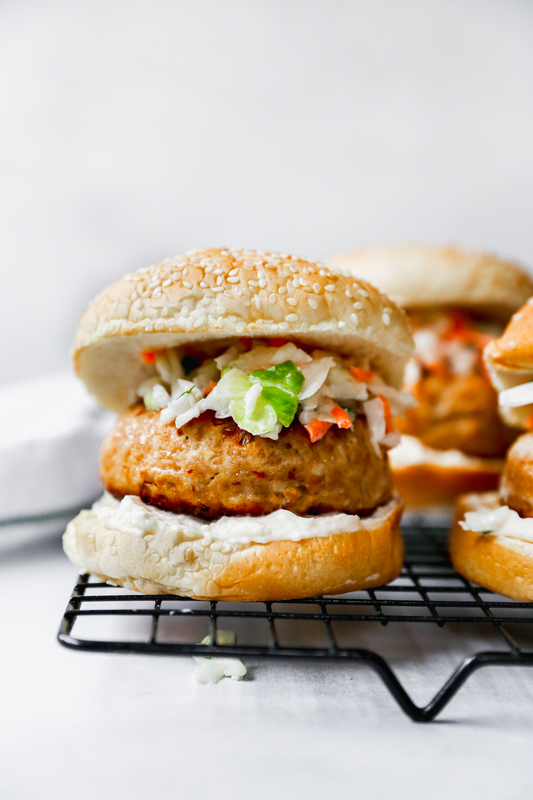 Remove the burgers from the fridge and drizzle them lightly with canola oil. Add them to the hot grill/pan and cook for 4-5 minutes per side (depending on how large you made the patties). Remove from the grill/pan and tent with foil until you are ready to serve. Whisk together the mayo, mustard, and grated garlic. Season, to taste, with salt and pepper. Spread some of the mayo on each burger bun. 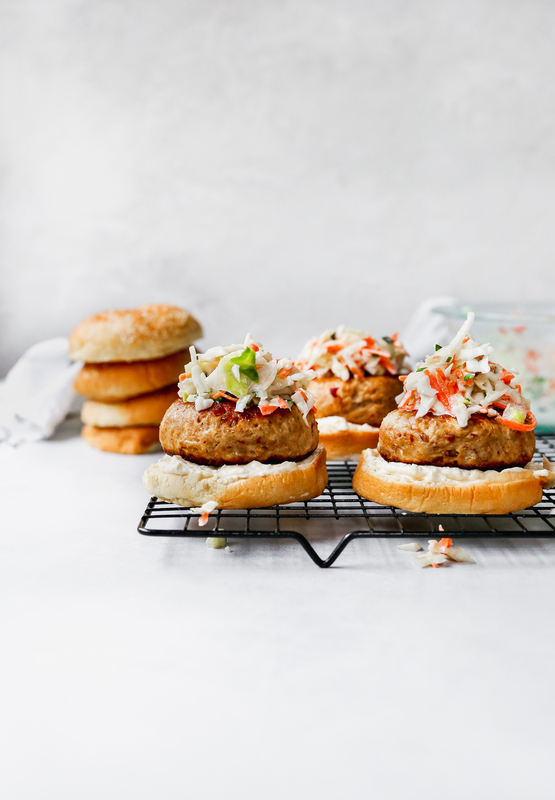 Add a burger to each burger bun and top with the slaw. Serve immediately.